Loaded Caprese Grilled Cheese, you think. That sounds good, you think. It’s summer, and the eating is good. Fresh tomatoes, spicy garlic, creamy butter, and perky green basil. You know it’s SUMMER-summer when they finally start stocking the huge containers of basil in the grocery store – the ones that come straight from a local grower or farmer instead of this five-basil-leaves-for-$5 nonsense that we Midwesterners struggle with through the fall, winter, and spring. You know those times you just get on a good run? It’s the opposite of a rut, in my mind: a rut is when you are bored with what you’re eating. You’re just eating to put food in your body. A run, though. A good run is when you legit *wow* yourself at every meal. It’s like the food of the season is speaking just to your tastebuds – you see possibility everywhere and you just cannot stop yourself from loving every. single. thing. Good news! I am on a run. I am just loving food lately – all kinds of food. Healthy food, homemade desserts, fair food, campfire spin-offs, and regular old grilled cheese sandwiches. Except that’s a lie; I’m not eating regular grilled cheese sandwiches. I’m eating loaded caprese grilled cheese sandwiches hot off the grill aka skillet. Holy yummers. These are so good. A key component to this cheese bomb masterpiece is the garlic butter tomato sauce, which comes together in about fifteen minutes and really deserves its own post. I’ve made variations of that garlic butter tomato sauce before, but this time the addition of balsamic is kicking it up a notch. Also, this one is THICK. Way thicker than any previous versions, in a really good way. It is borderline tomato jam, except not sweet, annnnd not really like jam. You guys know what I mean, right? Is this helping? Above all else, please just gaze upon the knob of butter that gets melted in at the end and the velvety finish that results. I know. See it and weep. Fun product alert: we are using Land O Lakes® Salted Butter in Half Sticks (cuuuute) for this recipe and they are the bees knees. 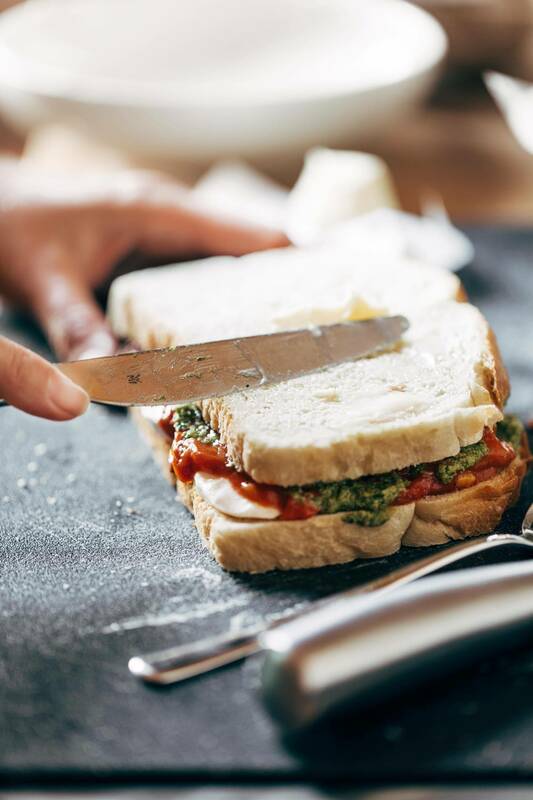 Rather than getting out a full stick of butter, you can just use the little half-size guys and use the first few pats of butter in your tomato sauce, and the second few pats of butter for frying up your sandwich. Could not be more slick. 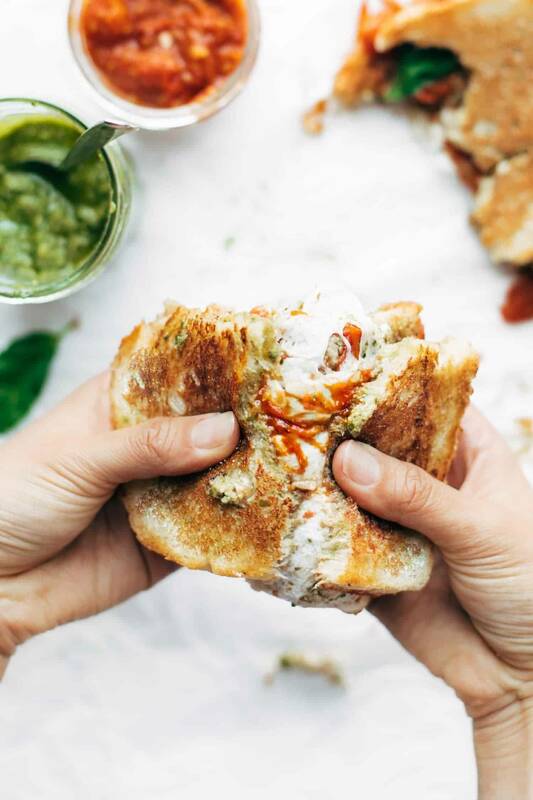 These sandwiches are an epic summer cheat. They are not for the faint of heart. I repeat: NOT FOR THE FAINT OF HEART. 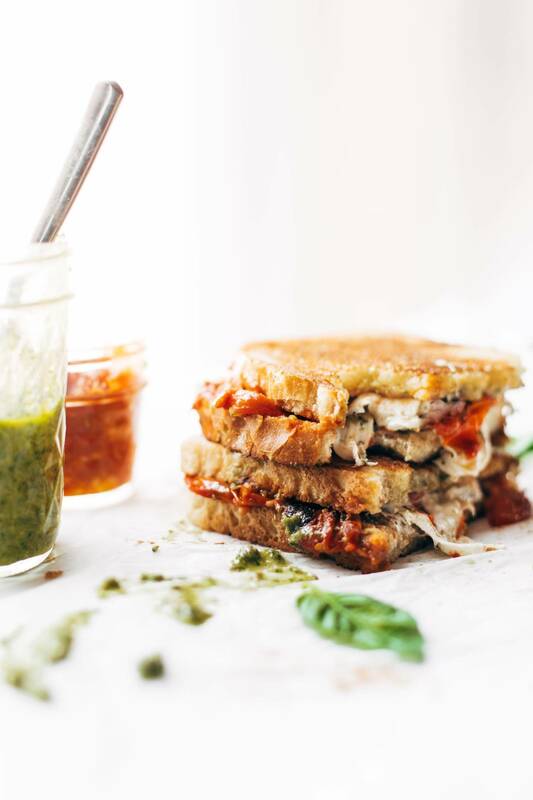 Molten mozzarella cheese will absolutely spill out the sides of your grilled sourdough, as will drips of pesto and chunky buttery garlic tomato sauce, and you will get a feeling in your heart that says: I was made for this caprese grilled cheese moment. 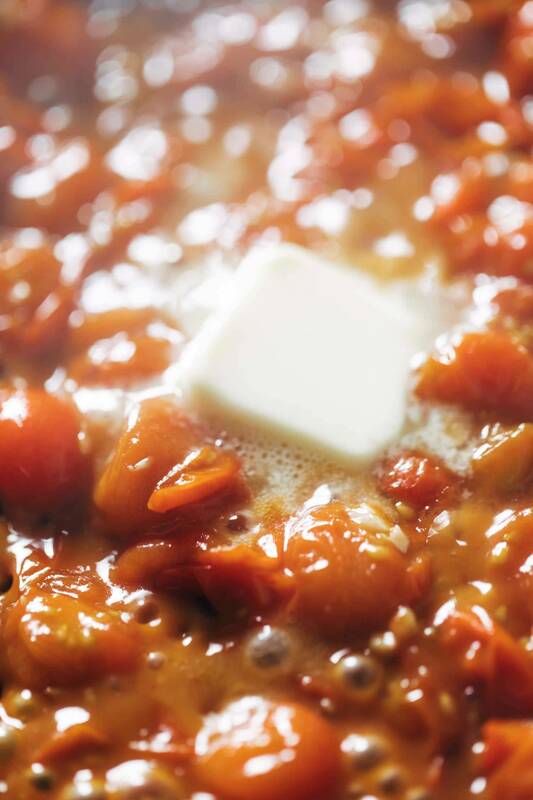 Make the Garlic Butter Tomato Sauce. Pour the tomatoes into a dry nonstick skillet. Heat until they start to get just slightly charred on the outside. Reduce heat and add one tablespoons of butter and give it a stir (it will probably splatter). Press the tomatoes gently with the back of a wooden spoon to release their juices. Add balsamic, garlic, and one more tablespoon butter. Simmer all together until thick and yummy. Season with salt and pepper. Pan-fry. Transfer your sandwich to a skillet over medium high heat. Cook until the cheese is melted, flipping once or twice to get both sides browned. When you pull that sandwich off the skillet, let me just tell you: you are in for THE BEST MOMENT OF YOUR LIFE. This recipe makes two whopper sandwiches. Works to serve two or four, depending on your self control. For the pesto, I used the Walnut Pesto from this recipe. Thank you to Land O’Lakes® for sponsoring this post! Omg–these sandwiches look amazing! I can’t wait to make this recipes! This recipe makes me love summer time even more! Delicious and simple! The garlic butter tomato sauce sounds fantastic! Thanks for the inspiration! I just last night made a caprese salad to use up some mozz that was rapidly approaching its expiration date. Clearly I need to go buy more…NOW! This sounds fabulous! It seems like a silly thing, but those half-sticks really are so convenient and great! And this sandwich looks amaaaaazing. I literally turned to Jesse yesterday and said “I need a good grilled cheese in my life asap”. THANK YOU for reading my mind. This looks out of this world delicious. This is totally better than something I’d be ordering at Panera at a fraction of the cost but the taste has gotta be close! And my tomatoes are coming along!!!! This sound wonderful….but somehow I missed the note about the pesto! Oh my word this looks incredible!! I can’t believe how easy that tomato sauce is, but you best believe I’ll be using it in everything for the rest of the summer! That is a whole other level. I love grown up grilled cheese, it’s my all time favorite comfort food and back pocket recipe. Gonna try this soon! OMG. I need this in my life. Like now. Your recipes never disappoint and this one looks like a total winner! Okay…this looks straight-up amazing. Caprese salads aren’t really my thing but I think you’ve won me over with this grilled cheese recipe! This caprese grilled cheese looks really good. Thanks for sharing this recipe. This. Looks. Great. Would totally make this in an Organic version for summer! You are definitely on the same food wave length as me. Summer is desserts and healthy farmers market inspired food. This sandwich! 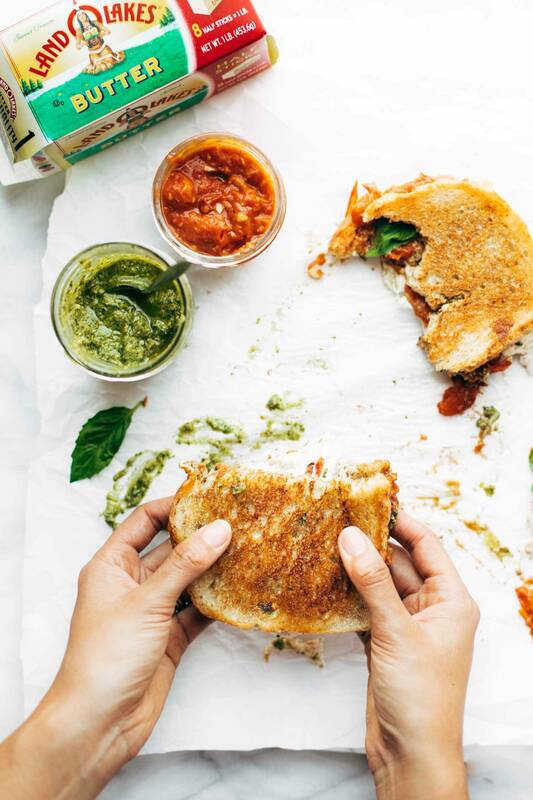 I’ve been obsessed with pesto, and that has extended to grilled cheese all summer but this tomatoes sauce concoction: next level! 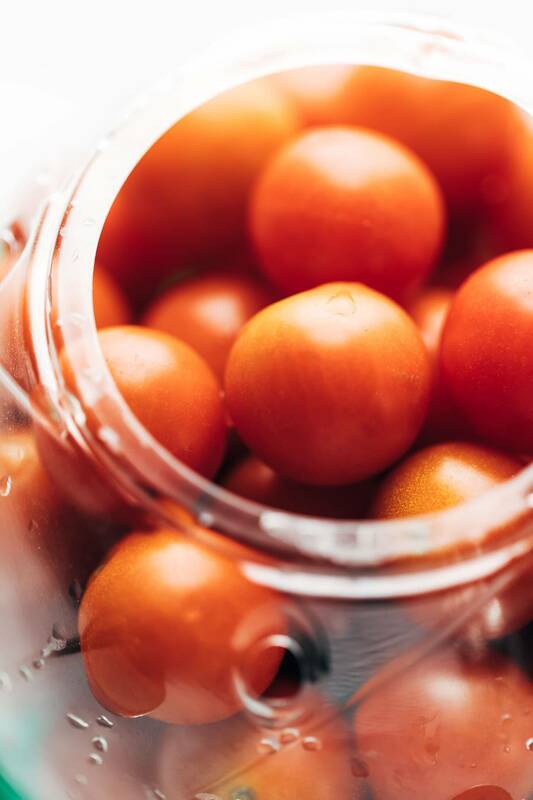 Such a delicious sweetness to the cooked tomatoes. This sandwich has the honor of being the last meal we make in our apartment before moving into our first house. Can’t wait to make your recipes in my new kitchen! Yes! The stuff of champions, this looks incredible!! My dad is really into making homemade sourdough bread (grinding his own flour and using only salt, water, and flour… I’m talking legit stuff) and my mom has a huge tomato garden. Can NOT wait to try this recipe next time I visit home. Perfection! LOVE the idea of combining caprese + grilled cheese. So delicious! Can’t wait to try!